This was requested by a YouTube friend. I personally avoid seams whenever possible. I just don't like to seam. When I bind off, I want to be done! But I do love how this makes an invisible join that you really can't see at all. Below are still photos, as well as a video of some small stockinette pieces being joined with Mattress Stitch. My sample was done on stockinette fabric, however this could really be used with any stitch or fabric. Do keep in mind that you should add a couple of extra stitches to the sides of your fabric so that you can seam easily, and you won't lose any width. Seaming takes away from the width of your fabric - patterns that require seaming should have that fact accounted for, so no need to worry about adding extra stitches if you are following a pattern. But if you are designing your own pattern, just keep in mind when calculating the size. Your fabric should be placed with right sides facing. You will be working in a side to side fashion. Use the same yarn that you knit your garment with. 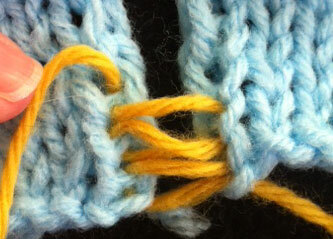 To make things easy, you can either reserve a length of tail from your cast on, or bind off, for this purpose. Or you can simply cut a length of yarn to use instead. 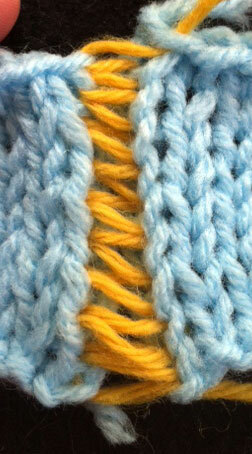 Don't seam along the immediate edge of your fabric; instead, move over to the first line of stitches. 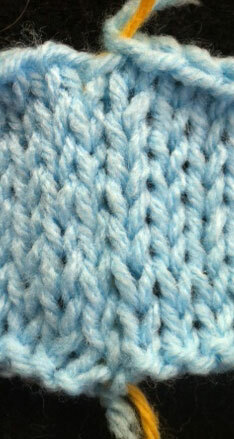 You could always move over two lines of stitches, but that will make the back side a bit bulkier. Be sure that you stay straight as you seam up the fabric. For the sake of clarity, we will say we are starting with the left piece of fabric here, but you may start with whichever piece of fabric you like. Beginning at the cast on edge of the left piece of fabric, insert your yarn or tapestry needle into the cast-on edge stitch, then do the same on the right piece of fabric. On the left piece of fabric, insert your needle under the first strand of yarn between the edge stitches and the first line of stitches. Repeat on the right piece of fabric. Continue moving left, right, left, right and so on, until you reach the top of your fabric. 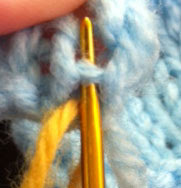 Then, insert the needle into the stitch along the bind off edge on both the left and right piece of fabric. Now, gently pull on the tail of your yarn to tighten things up. Pulling from both ends is easiest for me. You will see that the yarn you used to sew up disappears like magic. Don't pull too tightly or your fabric will become misshapen. Just pull gently until the seam is neat and even. Weave in the loose ends. Now, if you are like me, you may be scratching your head and saying "Huh?!" after reading that. I find visual aids much more easy to understand than the written word. So, here are some pictures, and the video. The yarn used to seam has been pulled tight, and I now have an invisible join! You can see how beautifully these pieces of stockinette fabric have been joined. 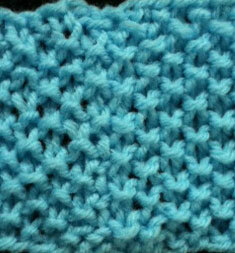 Here is a sample of seed stitch fabric I joined, which is just as nice. What about using this for pieces that are 5 feet long (an afghan)? When would you do the pulling? After how many inches? You could use this for seaming afghan pieces together; just use your judgment on how often you pull the yarn, I'd say every couple of inches or so.